While a second-year law student, Bill Bower identified a firm he really wanted to work for, one that promised to provide experience early. He tried to get an on-campus interview for a summer internship with the firm, but he ended up not making the cut. That did not prevent him from getting his foot in the door, however. He sat outside the interview room until the hiring manager had a break, made an introduction, and personally “talked my way into a job with the firm,” he says. There, he learned the value of taking what some may perceive as a rejection and turning it into an opportunity. “Failure is sometimes the best learning experience,” Bower says. In that time, he became closely acquainted with the practice of medicine, representing hospitals, physicians, nurses, and other health-care providers. 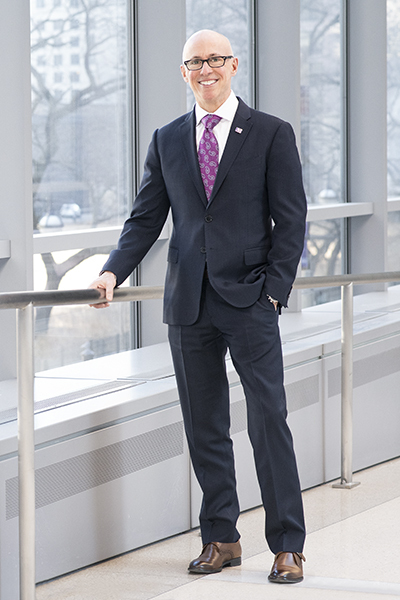 As he moved on from that firm and forged his own path, Bower continued to learn and grow in the health-care world, ultimately landing in his current role as senior vice president, administration for Northwestern Memorial HealthCare. The tenacity he admired in his first mentor had clearly rubbed off. Another lesson Bower needed to learn quickly at CNA was to never say no to a project or a challenge; the hard, undesirable tasks are often the most rewarding, he stresses. In the corporate world, lawyers can often be seen as a barrier rather than a business partner, but coming up with unexpected strategic solutions as a legal professional can be the key to positive outcomes. “You need to be the person who embraces the difficult task and executes on it,” he says. Bower was recently promoted to senior vice president of administration, working to advance the “patients-first” mission across the entire organization. Each year, Northwestern identifies fifteen to twenty key initiatives throughout the system, and Bower’s current role is to act as executive owner of several of these initiatives. One key initiative, he notes, is the process of centrally locating a shared service organization. Though the Northwestern team is still developing a plan for the change, Bower is confident this initiative will result in major improvements in operations. “It’s something relatively new in the health-care industry, but it adds so much efficiency and improves internal customer service.” he says.